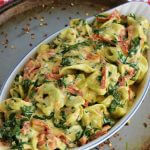 Cheese spinach tortellini are mixed with a delicious homemade garlicky parmesan cheese sauce that's flavored with sun-dried tomatoes and baby spinach. Boil the spinach tortellini 2 minutes less than the package directions. While the tortellini are cooking, start on the sauce. Over medium heat, melt the butter in a large skillet. Stir in the garlic and cook until fragrant. Whisk in the flour and keep stirring until it's absorbed and becomes pasty and smells nutty. Slowly whisk in the cream until it is smooth. Add 1/2 cup chicken broth and whisk until combined. Add the salt and Parmesan cheese. Allow it to simmer until thickened. About 2-3 minutes. If it seems too thick add another 1/4 cup chicken broth. Stir in the spinach and sun-dried tomatoes. Transfer the drained tortellini to the skillet and gently stir to coat the pasta with the sauce. Serve immediately.